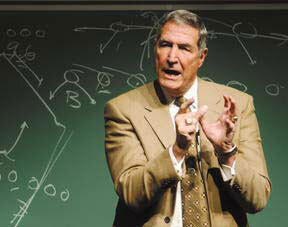 Gene Stallings talked about a lot more than football during his Thursday appearance at Sam Houston State University, although at one point he used a chalkboard to draw up plays to illustrate a point. The coaching legend was the first in the SHSU President's Speaker Series. Photo by Richard Nira/The Huntsville Item. Gene Stallings, a former football coach whose teams won national championships, imparted advice about life and success to an audience of college students and Huntsville community members during a lecture on the Sam Houston State University campus Thursday. The lecture, which drew a standing-room only crowd in the Killinger Auditorium of the George J. Beto Criminal Justice Center, was the first in the biannual President's Speaker Series, created by SHSU president James Gaertner. Using anecdotes from his coaching experiences and personal life to illustrate, Stallings said he urges young people to take their education seriously, be patient and not be afraid of failure. "Most of us want to live in that comfortable environment and don't want to get out of it, and then we look and see that life has passed us by," he said. When he was coaching, he said valued his players' commitment and their ability to perform under stress, which extends to other parts of their lives. "Somewhere along the line, we have to compete under pressure," he said. "Somewhere along the line, we prepare ourselves to respond to a challenge." Stallings became head coach at Texas A&M in 1965, and his team won the Southwest Conference championship in 1967 and the Cotton Bowl in 1968. He became the head coach for the NFL's St. Louis Cardinals in 1986, before taking over as head coach for the University of Alabama in 1990 and leading them to a national championship title in 1992. Kofi Amua-Sekyi, a sophomore majoring in advertising, said he played football in high school and heard his father talk about Stallings. He said Stallings' lecture was entertaining. "I sort of enjoyed hearing about his previous experiences in coaching football," Amua-Sekyi said. Jason Hogg, a junior majoring in accounting, said he found some of the messages in the speech thought provoking. "It made me think a little bit about making some changes in my life, to become a better person," Hogg said.